This six-location sit-down restaurant specializes in customized meatball bowls built on pasta, polenta, veggies and other ingredients. 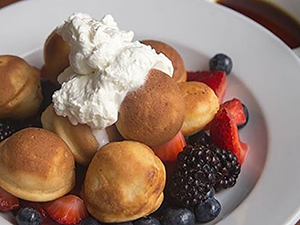 In keeping with the Meatball Shop’s theme, the kitchen makes waffles in spherical shapes to serve at brunch. The batter is baked in a takoyaki plate—a cast-iron pan with 16 round wells designed for making Japanese octopus cakes. 1. Preheat oven to 400F. In large bowl, mix flour, cornstarch, sugar, baking powder, salt and baking soda until combined. 2. In a medium bowl, whisk together buttermilk and butter. Whisk in vanilla and egg until blended. 3. Pour liquid ingredients into dry ingredients and whisk to combine. Pour batter in heated cast-iron takoyaki pan and bake in 400 F. oven for 7 minutes until golden brown. Serve with berries, whipped cream and syrup.